Speleothems (mineral deposits that formed in caves) are currently giving us some of the most exciting insights into environments and climates during the Pleistocene ice ages and the subsequent Holocene rise of civilizations. 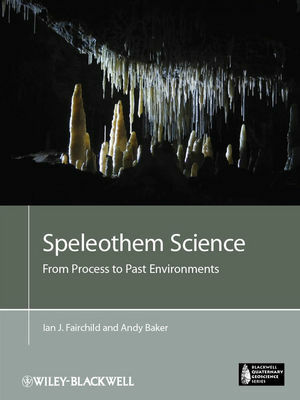 The book applies system science to Quaternary environments in a new and rigorous way and gives holistic explanations the relations between the properties of speleothems and the climatic and cave setting in which they are found. It is designed as the ideal companion to someone embarking on speleothem research and, since the underlying science is very broad, it will also be invaluable to a wide variety of others. Students and professional scientists interested in carbonate rocks, karst hydrogeology, climatology, aqueous geochemistry, carbonate geochemistry and the calibration of climatic proxies will find up-to-date reviews of these topics here. The book will also be valuable to Quaternary scientists who, up to now, have lacked a thorough overview of these important archives. Additional resources for this book can be found at: www.wiley.com/go/fairchild/speleothem.